Each individual’s complexion is unique by its own nature. Therefore different replenishments and improvements are required for different skin texture and condition. Our experienced medical team will carry out skin analysis and design the Light Me Up Treatment according to your age, skin condition, living and eating habits, and esthetics needs. Customers undergo 2 types of personalized treatment simultaneously out of 13 internationally certified therapies, including varies laser treatments, IPL or peeling treatments (over 50 combinations of treatments) to effectuate the best result. Different medical beauty treatments target different skin problems. Yet relying on a single medical beauty machine may not achieve the best result. Light Me Up Treatment resolves problems from roots with overall 3 benefits: eliminate skin problems, activate and stimulate the regeneration cycle and skin cells, allowing the skin to retain its youthful and flawless nature, empowering individuals in their search for endless beauty in the shortest amount of time! Aircrafts need regular cleaning to remove dirt without damaging the plane. The best way is to use a jet of pressurized detergent in high velocity. Similarly, regular dead skin removal is needed without causing any damages to the skin. Pressurized oxygen, micro droplets and nutrients can be delivered into the skin through the Oxygen Jet Peel Treatment. As such, it facilitates deep cleaning and skin vitalization. When pressurized oxygen and moisture are ejected from a jet catheter to skin with high velocity, apart from removing all the dead skin cells in the epidermis, it can also clear dirt and sebum in clogged pores, preventing the formation of blackheads, whiteheads and acnes. Nutrients will be ejected from a jet catheter to skin with high speed. The jet pressure can refine and smoothen acne depressions effectively. Skin Rejuvenation Medical Peeling Treatment uses oil-soluble medical peeling ingredient, Butylated hydroxyanisole (BHA), which can penetrate deep into the stratum comeum and pores to dissolve excessive sebum and remove accumulated dead skin cells, facilitating the growth of epidermal cells. Keratinocytes renew itself every 21-28 days. If the metabolism is not working properly, dead skin cells will accumulate, leading to rough and dull skin texture. The butylated hydroxyanisole (BHA) can dissolve the substance between stratum comeum. Dead skin cells will then peel off, facilitating metabolism. Pores are enlarged when clogged by dirt and sebum. Oil-soluble butylated hydroxyanisole (BHA) can move along sebaceous gland into deep pores to dissolve dead skin cells and dirt. Pores are then refined due to the clearance of pore clogging. When the sebaceous glands are clogged by excessive sebum, the secretion cannot be drained away, facilitating acne formation. The butylated hydroxyanisole (BHA) is able to remove excessive sebum and dead skin cells, preventing acnes due to inflammation of pore clogging. Microdermabrasion Rejuvenation Treatment is a painless and safe treatment to remove dead skin cells and stimulate new collagen growth. Tungsten Carbide, a hard and hypoallergenic alloy, is highly compatible with skin. The innovative disposable Diamond Sticks suit different types of skin, even the sensitive areas around the eyes. Besides, the latest suction roller design is more secure and stable than the traditional pneumatic one. In combination with the laser treatment, light beams penetrate into skin easily. Satisfactory treatment outcomes will be achieved. Keratinocytes renew itself every 21-28 days. This process will be slowed down if the metabolic rate decreases, resulting in dead skin cells accumulation, hindering the adsorption of skin care products. Microdermabrasion Rejuvenation Treatment can remove accumulated dead skin cells and facilitate metabolism, allowing better absorption of nutrients by the skin. Skin roughness leads to dull skin tone. Through Microdermabrasion Rejuvenation Treatment, skin will be smoothened and brightened. The skin around the eyes is fragile and sensitive. Microdermabrasion Rejuvenation Treatment is specially designed for skin in those areas, which can reduce pigmentation, puffiness and dark circles. Wrinkles caused by dehydration due to the accumulation of dead skin cells and fine milias would be improved significantly. The suction moves along lymphatic directions, so facial puffiness will be alleviated. CO2 Laser Treatment releases thousands of light beams in a short period of time, resulting in various tiny wounds on the skin. This ablative medical laser will vaporize the unwanted tissue on the epidermis accurately. At the same time, it stimulates collagen growth in the dermis. As such, the skin is rejuvenated, pores are refined, wrinkles and scars are smoothened. If acnes are treated inappropriately such as squeezing, inflammation will be further deteriorated, damaging the dermis and forming depressed scars. Through CO2 ablative laser treatment, the skin will be smoothened. Nevus is located between the epidermis and the dermis. CO2 laser can remove the nevus directly. After the treatment, the treated area will form a scab and peel off automatically in about one week. Wart is a skin disease caused by virus infection. The virus is spread through small wounds by contacts. CO2 laser can precisely remove wart tissue. After the treatment, the treated area will form a scab and peel off automatically in about one week. During the treatment the energy released by laser stimulates collagen in the dermis to restructure and rejuvenate, restoring elasticity in the skin. It also smoothens out wrinkles and improves skin quality. Optimal Pulse Technology (OPT™) Treatment is the fifth generation of the patented pulse technology with multiple outputs of wavelength lasers. In response to different skin problems of each individual, different tailor-made wavelength of intense pulsed lights can be applied during the treatment, result in an overall improvement in variety of skin problems. It suits Asian skin the most. A continuously cooled applicator can protect epidermis during the treatment to minimize any discomfort during the treatment. The Optimal Pulse Technology (OPT™) controls pulse shape by equalizing energy distribution over the entire pulse or sequential pulses, enabling a stable and even laser output. It can tackle different treatment needs accurately. The Optimal Pulse Technology (OPT™) can target the exact position of pigments, enter and generate heat to dissolve them during the spot removal treatment. As the light only concentrates on certain skin area, the Optimal Pulse Technology (OPT™) Treatment can diminish the melasma, while the healthy skin around the melasma and spots would not be affected. Wrinkles can be divided into two types: dynamic and static, and fine wrinkles belong to static one in most cases. Significant improvements are visible by using the Optimal Pulse Technology (OPT™) Treatment. Enlarged pores and coarse skin are due to excessive seborrhoea and aging. OPT™ is reliable and safe to improve the skin condition, resulting in whitened and tightened skin. Saggy skins due to photo-aging can be improved significantly by OPT™. The skin will be tighten and become youthful in result. Q-Switch Nd:YAG 1064 laser toning treatment releases 1064nm laser in a nanoseconds. A high-powered pulse is formed. When melanin absorbs the energy, it will be destroyed and the skin tone becomes bright and radiant. Deeper coloured pigments such as cheekbones nevus, Ota nevus and other dark spots located in the dermis can be alleviated by Q-Switch Nd:YAG 1064 Laser. An even skin tone results. Q-Switch Nd:YAG 1064 Laser Treatment can remove black, blue and brown tattoos significantly. 755nm wavelength laser is highly attracted to the melanin. The Q-Switch Alexandrite laser destroys the melanin through penetration to the dermis, and the remains will be removed by the immune system. Q-Switch Alexandrite removes pigmentation like café au lait spots, cheekbones nevus, Ota nevus, sun spots and seborrheic keratosis significantly. Inheritance or external factors lead to melanin formation, resulting in dull skin tone. Q-Switch Alexandrite laser can destroy melanin and brighten the skin. Q-Switch Alexandrite laser can remove black, blue and green tattoos significantly. Long-pulse Alexandrite Laser Treatment mainly targets skin pigments. Its 755nm wavelength laser is highly attracted to the melanin. As laser penetrates into the skin, it destroys the melanin. The pigments then scab and peel off. Besides, the laser destroys melanin located in hair follicles, eliminating or impeding the hair’s re-growth. Inheritance or external factors will result in a mass of melanin production, which later forms skin pigments. Through penetration, the laser energy destroys and diminishes pigments. The growth cycle of hair can be divided into three phrases, including growth (anagen), degradation (catagen), and resting (telogen) phases. The laser emitted by Long-pulse Alexandrite Laser Treatment targets those hair follicles in anagen phase. Heat generated by the laser energy destroys the melanin located in hair follicles in order to eliminate or impede the hair’s re-growth. 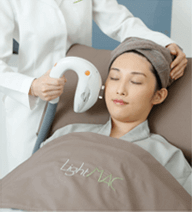 The non-abrasive Long-pulse Nd:YAG 1064 Laser Treatment facilitates collagen growth. When the 1064nm wavelength laser penetrates into the skin, it releases heat energy and stimulates the fibroblasts, facilitating metabolism. Healthy skin rejuvenates every 28 days. Dead skin cells will be removed by metabolism. This process will be slowed down if the metabolic rate decreases, resulting in different problems. When the skin absorbs the energy of the laser, it stimulates the fibroblasts, facilitating metabolism. As such, rejuvenation cycle can be restored to normal. Collagen loss results in loss of elasticity in skin. Long-pulse Nd:YAG 1064 Laser Treatment stimulates the fibroblasts to produce collagen, improving the moisture retention ability of cells. Skin elasticity is restored. Glycolic Acid Collagen Reform Medical Peeling Treatment uses glycolic acid. Its fine molecular weight can penetrate into the underlying skin easily, leading to a perfect outcome. It is the safest and the most effective ingredient of medical peeling. Glycolic acid is extracted from sugar cane which is water-soluble. Thus it can penetrate easily due to the integration with body water, enhancing cells metabolism. Collagen in the dermis can be stimulated and rejuvenated. Keratinocytes renew itself every 21-28 days. If the metabolism is not working properly, the rejuvenated power of skin cells will be slower respectively, hence the old skin cells cannot fall off naturally, dull skin tone results. Collagen Reform Medical Peeling Treatment facilitates dead skin cells to fall off and brightens skin tone instantly. Apart from removing dead skin cells, glycolic acid also dissolves the decomposed melanin and impedes the formation of melanin protein. As such, it helps skin whitening. Glycolic Acid can effectively penetrate into the underlying skin due to its fine molecular weight, which stimulates the fibroblasts to generate more collagen. As such, skin elasticity is restored. *The LightMAC medical expert team will recommend the most appropriate combination of treatments after consulting with customers to accommodate for each customer’s unique needs. A survey was conducted upon 250 customers who experienced 6 consecutive customized sessions of the “Light Me Up Total Solution Facial Treatment”. 1.LightMAC centers are in modern and fashion design. 2.Our Professional health care team have undergone professional training and rigorous assessment, supported with advanced technology, customers access a safe, reliable and efficient treatment program. 3.According to the skin assessment, state, needs, in-depth understanding and analysis, we customize your own exclusive optical or peeling treatment. 4.Undergoing 2 types of personalized optical or skin peeling treatment simultaneously, helps to eliminate skin problems, activate and regenerate skin cell in the shortest period of time. 5.Post-treatment evaluation and skin care recommendations are provided. 1. Why we have to undergo 2 types of personalized optical or skin peeling treatment simultaneously at every session of Light Me Up treatment? LightMAC believes each individual needs different replenishments and improvements for their own skin texture and condition. Doing single treatment alone can tackle one problem, such as collagen boosting, lifting or pigmentation, at a time; the result is imperfect after all, particularly it varies with your skin condition or with thickening stratum corneum. Applying 2 types of customized therapies at a time would maximize the treatment benefit with an all -rounded care to your skin within a short period of time. 2. How many sessions of Light Me Up Total Solution Facial Treatment are required for customers to experience significant improvements in their skin conditions? Our medical experts strive towards accommodating for our customer’s exclusive needs. Customers simultaneously undergo 2 types of personalized treatment out of 13 types of internationally certified laser or peeling treatments can generally experience noticeable Improvements after 6-12 treatment sessions. 3. Is the Light Me Up Total Solution Facial Treatment safe? The Light Me Up Total Solution Facial Treatment encompasses 13 different types of treatments, which adopts the use of internationally certified advance technology, guaranteeing our customers professional and safe medical services. 4. Are there any precautions prior to receiving the Light Me Up Total Solution Facial Treatment? • Being exposed to intensive sunlight or UV light. 5. How long is each treatment interval?